Bright golden amber color. Smoky aromas of sea salt, olive oil, flamed orange peel, douglas fir, singed quassia, leather, and raisins in honey with a round, vibrant, dry-yet-fruity medium-to-full body and a peppery, interesting, medium-long dried mint, lavender, rosemary, thyme, green peppercorn, and eucalyptus finish. A vividly spicy and herbal American Single Malt with world-class depth and balance; a very memorable dram. Bottom Line: A vividly spicy and herbal American Single Malt with world-class depth and balance; a very memorable dram. 85 • Copperworks Distilling Company Northwest Washington Malt Vodka 40% (USA) $32.00. 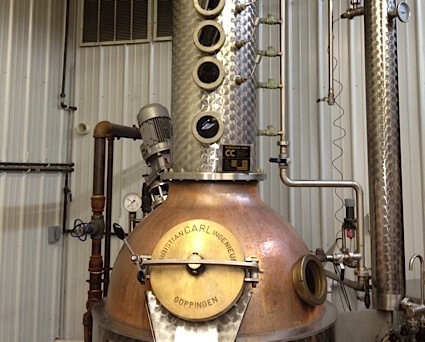 92 • Copperworks Distilling Company Northwest Cask Finished Gin 50% (USA) $45.00. 81 • Copperworks Distilling Company Northwest Small Batch Gin 47% (USA) $38.95. 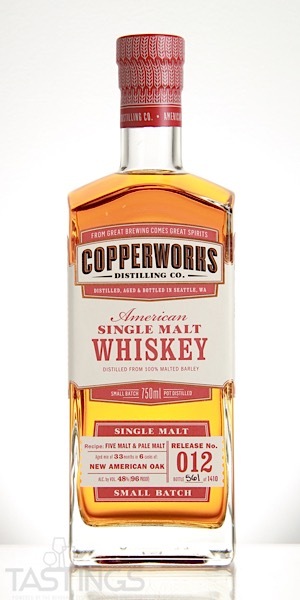 96 • Copperworks Distilling Company American Single Malt Whiskey 48% (USA) $59.99. While rare, there are a handful of American single malt whiskeys being crafted today; they are produced entirely from malted barley. Based on the single malts from Scotland, the American versions also resemble their more famous whiskeys in their peaty, sweet wood notes. Like their counterparts from Scotland, serve after dinner in a small snifter. Copperworks Distilling Company American Single Malt Whiskey rating was calculated by tastings.com to be 96 points out of 100 on 8/22/2018. Please note that MSRP may have changed since the date of our review.